What do you want to “calculate or know about,” asks Wolfram Alpha. Voted the best computer innovation of 2009 in Popular Science‘s “Best of What’s New,” Wolfram Alpha lets users interact with over 10 trillion pieces of information curated by a large research team. You just type in what you want to know, the engine tries to figure out what you’re asking it, and you’re presented with a remarkable array of information (as well as ways to refine your subsequent searches). This has tremendous historical applications, both for teaching and for historical research. I’ll show off some of these possibilities in this post, and hope that you take a moment to try it out yourself. If you find anything of particular interest, please let us know in the comments below. Wolfram Alpha likes to help you out. By simple typing ‘history’ into the answer engine, you’ll get a page demonstrating all the cool things you can do for historical topics. This is a reliable source of simple information for anybody wanting to quickly access basic facts. As noted by Léon Robichaud in the comments, however, however, the data on Canadian Prime Ministers is faulty – Meighen was the 9th Prime Minister but had the 3rd shortest term; similarly, 1st Prime Minister returns Harper! For example, if you type ‘3rd Prime Minister of Canada’ into the engine, you’ll see it parsed as ‘Canada’ ‘Prime Minister’ ‘3rd.’ And then you would [erroneously] learn that the third Prime Minister of Canada was Arthur Meighen, he governed for 2 months and 27 days, he was born in Toronto 137 years ago and died 51 years ago at the age of 86. What’s going on with the Prime Minister section? Turns out that Wolfram is parsing the information in a peculiar way! It’s interpreting the list of prime ministers by term-length. You can see this by pulling up the list (press ‘more‘ on sequence to see Alpha’s take on it). There you have the correct sequence, but the data parses it by focusing on the LENGTH field as opposed to the sequence you have. This appears to be a unique manifestation, as opposed to the American list of presidents. This is perhaps a more valuable lesson than the original post entailed! In any case, I’ll report this to Wolfram Alpha as it’s clearly not returning the data that we want. That way they can refine their results better. There is a ‘feedback’ button on the bottom of every page. Say that you’ve always wondered what your ‘third cousin’ really is: a simple search demonstrates a genealogical chart! Population information abounds in the database: you can learn the population growth percentages of Canada between 1945 and 1960, or the population circa 1911 (7.21 million people, the 33rd largest country then in the World, and probably weighing approximately 504 462 metric tons). You can also access basic biographic (Harriet Tubman) or comparative biographic information (Stephen Harper and Pierre Trudeau), information on historical events (D-Day), or even defunct empires (Austro-Hungary). The showdown everybody has been waiting for: the name Ian vs. the name Edith! For contemporary information, you can do a search such as ‘Income Inequality of Canada vs United States‘ and quickly learn out Gini indexes, income share held by the various fifths of the population. How frequent does your own name appear? I learn that ‘Ian’ is the 72nd most popular name in the United States, and it has been steadily increasingly in popularity since 1960 or so. It’s a young name. Edith, on the other hand, is pretty unpopular these days – although it was pretty popular back in the day. Indeed, about 2% of people in their late 80s are named ‘Edith’ (as opposed to less than half a percentage under 10 these days). You can even do showdowns: “Ian vs. Edith” to see the relative ranges [my apologies to any of our readers named Edith – quite frankly, we both pale in comparison to the most popular US given names!]. Or simpler, everyday things: exchange rates, both historically and today (right now $2500 Canadian gets you $2538.38 US). You can have a lot of fun with this information. For each result, you can see what sources were used to generate the information. If anything, it’s a snapshot into the future: refined, intelligent knowledge acquisition. What do you think? Toy or tool? Would you encourage your undergraduates to check it out and play with it? How trustworthy is the information? Are you just thrilled to have a simple way to figure out how you’re related to your grandmother’s aunt? I love Wolfram Alpha, but you have to be careful about how you search it. Meighen was not the 3rd prime minister, he was the 9th. He was the PM with the 3rd shortest term in office (June 28, 1926 – September 25, 1926) during the King-Byng affair. Forgot to mention that he had served a previous slightly longer term (July 10, 1920 – December 29, 1921). Interestingly, when you ask “1st prime minister of Canada”, the answer seems to be Stephen Harper. I guess their definition of 1st is quite peculiar in Canada’s case because for the US, they show George Washington. This is perhaps an even more valuable lesson than my original one: concerning the perils of Wolfram Alpha. Considering that I actually know the historical sequence (more of a cocktail party trick), it led me down the road of just reproducing results. I’ve put a correction above. Mulroney was not the 4th prime minister, as Wolfram parses. You can see how the engine is processing the search query here: http://www.wolframalpha.com/input/?i=prime+minister+of+canada (click on ‘more’ after sequence). It’s very interesting that it’s parsing the list of Prime Ministers through length of term. Indeed, 2nd Prime Minister returns Meighan as well on his aforementioned 10 July 1920 – 29 December 1921 term. This is opposed to American presidents, as Léon points out. I’ll provide feedback to Wolfram Alpha on this so they can refine it. I’m also curious, Léon, if you’ve used Wolfram Alpha in your own work on a digital history of New France? Or if you’ve just found it to be a fun toy to play with? As an update, thanks to this discussion, Wolfram Alpha has now fixed up the prime minister lists (except for ‘1st,’ which still returns Stephen Harper – I suspect there’s some confusion around first minister/prime minister). 3rd Prime Minister now returns MacDonald during his second tenure. I am more curious about the concept of a “curated knowledge system”. 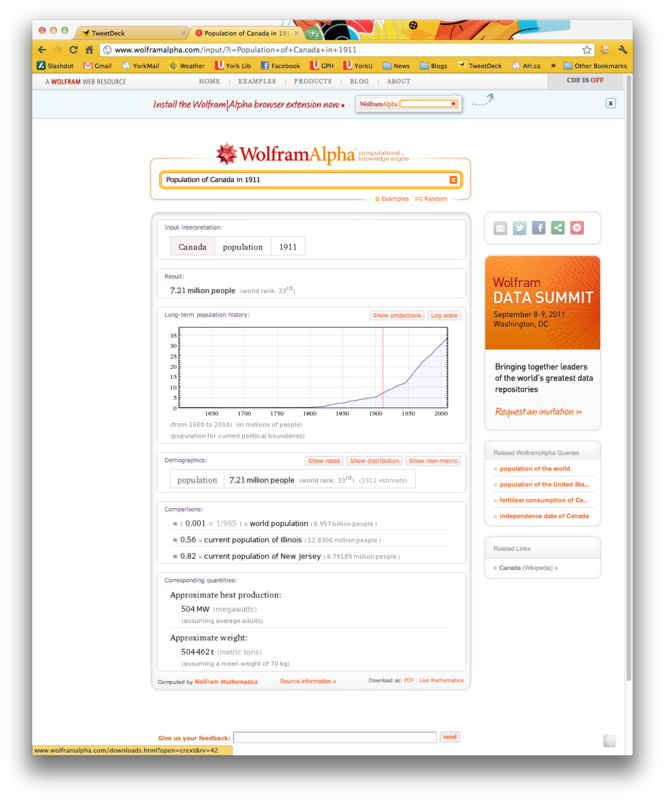 Wolfram Alpha contains very limited information for periods before the statistical age and is therefore of limited use for New France. If his Genealogy and History Research Assistant App is ever ported to Android, I will certainly give it a spin. I just landed here more or less by accident but I’m thrilled to have found a Canadian blog about history. By coincidence, Stephen Gordon of Laval just posted a blog item in which he states: “A final technical note: regular readers may be wondering about posts like this, which document the increasing concentration of income in an increasingly smaller number of high earners. Why aren’t we seeing this trend in the Gini coefficients? The answer is that Gini coefficients don’t do a very good job of capturing this trend – which is why there’s such an active research agenda on the question of how to measure inequality.” So, in a way, it might be somewhat misleading for Wolfram-Alpha to offer the Gini as a measure of inequality, especially since calculations of Gini in some jurisdictions can ignore taxes and transfers. Hi Bill, Glad you found us! Thanks for the comment and the insightful link. It makes a really good point, especially as I personally am trying to grapple with statistics and how they’re borne out through lived experience (the social history side of things). From my limited knowledge, I gather that the Gini is useful only mainly because of its simplicity and ability to very quickly compare countries (hence its easy integration with Wolfram Alpha) – but the linked post does a great job of showing its limitations.